Publication Information: Ulysses Press. 2013. 128 pages. Favorite Quote: "If you have never had a green smoothie before, I can assure you that they taste a lot better than they look or sound." Green Smoothies for Every Season is not a beginner's book, i.e. not for someone new to smoothies or green smoothies. The table of contents for the book reads: Introduction, Spring, Summer, Autumn, and Winter. The Introduction is about a third of the book. The book in total has only about 50 recipes. The recipes themselves are simply a list of ingredient combinations because beyond that the directions for a smoothie are simple - Blend together and enjoy. You may have to rely on the instruction of your blender in terms of how and in which order to add ingredients. 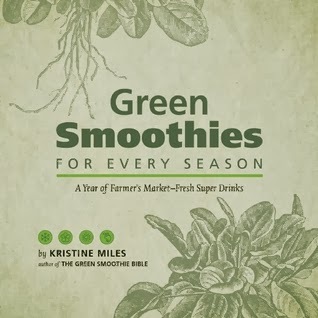 The introduction includes a discussion on the health benefits and nutrients of green smoothies, seasonality of produce, and the use of other ingredients like sweeteners, herbs, and protein. Each section starts with a list of the produce in season and its characteristics and benefits. The actual recipes are set apart from the text by the fact that they are printed on green paper. So, by looking for the green sections, I can get to the recipes quickly. The book has only a high level table of content. Some recipe titles (which are indexed) are cute rather than informational. "Pacific Sunset" and "Don't Worry, Be Happy" are two examples. Some of the recipes rely on produce and greens such as kumquats, passion fruits, dandelion greens, borage leaves, tender pea shoots, that may not be readily available. The book only has about 50 recipes. If you are looking for a resource on green smoothies, there are probably better sources out there. This one may not be staying in my cookbook collection.